Here in the Mission Office, we oversee many programs; all of them have a different place in the family quilt that make up the four Pontifical Mission Societies. One of our more visible programs is for the Propagation of the Faith – the Mission Co-operative program. Every year, we receive letters from missionaries asking for the opportunity to come to Boston and do one thing – tell the story of their life’s work, that of the spread of the Gospel. In their letters, we hear that words alone are not enough. Their Christ-like actions on behalf of the most marginalized people of our world make them a beacon of hope for those they serve. We prayerfully invite to speak in local parishes those we feel represent the greatest cross section of the mission world: Priests, Sisters, brothers and lay people at work around the globe. And so, they come to share their stories. This year, we will hear from Bishop Paul Duffy, O.M.I. Born and raised in Norwood, MA, Bishop Duffy serves as the head of the Diocese of Mongu, Zambia. The struggles faced by his people are very different from those he was raised with: food and medicine are scarce and natural disasters compound the suffering of the poor. Zambia is also at the heart of the HIV/AIDS epidemic. 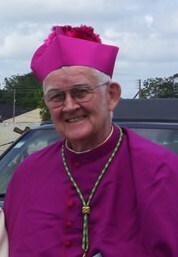 Bishop Duffy has been central to the set-up of AIDS outreach programs and the establishment of an AIDS Hospice. Local parishes will also hear from Holly Benner, Founder of “Needs for Africa”. Holly’s story is one that will inspire us all to think about the effect that one person can have on the world. 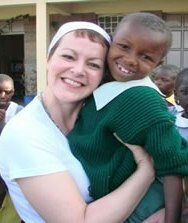 A convert to Catholicism, Holly felt God calling her to bring clean water to those in Africa. She started by selling pizzas and baked goods out of the trunk of her car in Bethlehem, PA. Four years later, “Needs for Africa” is funding wells and boreholes in villages in Nigeria and Tanzania, at a clinic in Uganda and at an orphanage in Kenya. She is a marvelous example of how one person's faith can truly change the world. As members of our One Family in Mission, we welcome Bishop Duffy, Holly Benner and all the visiting Missionaries to our home in Boston. As we gather around our Family table at the Eucharist, we pray for their safety and success as they share their stories with the rest of our family – you.